If you have never booked an instrumentalist such as a cellist before, you may be a little worried that you don’t know enough about their performance to part with your hard earned cash. Suitable for plenty of events, such as wedding ceremonies and cocktail parties, cellists are more popular than ever and offer a warm, rich sound to your background ambiance. Here at www.EntertainersWorldwide.com we have put together 10 questions which you might want to ask a cellist before you book, but remember this is just a guide and you should never be afraid to ask a performer any questions you might have on your mind! 1 – Are you available to perform on the date of my event? This is probably one of the most important questions you will need to ask a cellist because if they are already fully booked, there really isn’t much point in asking them anything else! Always check with a cellist to ensure that they are free to perform on the date of your event and remember that many types of entertainer get booked up rather far in advance, so if you are looking for entertainment for your wedding (for example), make sure you get your entertainment booked up before it’s too late! 2 – How much do you charge and do I need to pay a deposit? If you find that your chosen cellist is available to perform at your event, the next question you might want to ask is how much they will charge for their performance. If you have a set budget in mind, this question becomes more important so that you are not left disappointed. Most cellists will have their own set fees, plus travel expenses if they are travelling out of their area. Deposits are almost always required and the amount can vary between performers. In fact, if a performer is offering to book you in without a deposit, we would continue with caution. 3 – Do you have any experience in performing at events such as mine? Although this isn’t of imperative importance, it is always good to know that your chosen cellist has performed at a similar event to your own. This is not always possible especially if you are taking a chance on a new performer, however if you want to make sure that you are going to get the best possible performance, try to find a cellist that has already performed at similar events so that they have experience and more confidence. 4 – Will you need much space for your set up at my venue? Depending on the size of your venue, it might be worth asking how much space a cellist will need to perform. Also ask if they will need a chair or any special set-up requirements so that you can relay these to your venue beforehand. Most cellists won’t need much space which makes them very suitable for many different sized venues. 5 – How long will you perform for at my event? Before paying your deposit, always check how long a cellist will perform for. If you need them to stay longer, they may increase their prices to reflect this so it is always a good idea to agree on a performance length and price before you commit to booking. Most cellists are happy to perform for a couple of hours with breaks in-between. 6 – Will you need refreshments provided, such as food and drink? If your event is going to be particularly long, you should really provide refreshments for your entertainer. If you are hiring a cellist for your wedding, you don’t need to give them a sit-down dinner – a light lunch will be well received along with drinks throughout the day. Always make sure you look after your instrumentalist to get the best possible performance and to prevent dehydration and tiredness. 7 – Can I see you perform live before we commit to booking? Not every performer will offer the ability to see them live before you book them, however many will offer this as a way to get a feel for their performance. Sometimes they will invite you to meet with them and give you a short demonstration, or if they play locally in concerts, you could be invited to those too. Perhaps you are booking for your wedding and your chosen performer will be playing at a local wedding fayre? It’s not necessarily needed if you have viewed video or listened to audio samples of your cellist but it does put your mind at ease before booking. 8 – What happens if you are ill on the day of my event? This question is another big, important question because the last thing you want it to plan for a cellist to perform at your event, for them to become ill and not turn up. Many cellists will know other instrumentalists and performers and sometimes they will keep one as a back-up to replace them in the event of illness. Check with your chosen cellist for their refund policy too, in-case this a replacement is not possible. 9 – Do you have any testimonials or reviews from previous clients? Before booking any instrumentalist, it is a good idea to get previous customer testimonials and reviews. Many of the acts listed on our website, www.EntertainersWorldwide.com do showcase these on their profile, however if they aren’t available never be scared to ask for them! If you are taking a chance on a new performer, be aware that they may not have any feedback yet. 10 – Can I see a list of song choices (also known as repertoire)? Since it is impossible for a cellist to learn every single song in the world, they will have a dedicated list of songs that they can perform. This may include classical music and also modern instrumental versions of popular songs from today. Always ask to see what they can play so that you can perhaps request certain songs off their list. If there is a particular song that is meaningful to you and not on their list, it doesn’t hurt to ask if they can learn it. This may occur an additional fee but is well worthwhile. There may be other questions that we have not included that you think about to ask your chosen cellist before you book, so always make a note of anything that pops into your head. Remember our website does take out a lot of the hard work by providing you with profiles of entertainers filled with information. 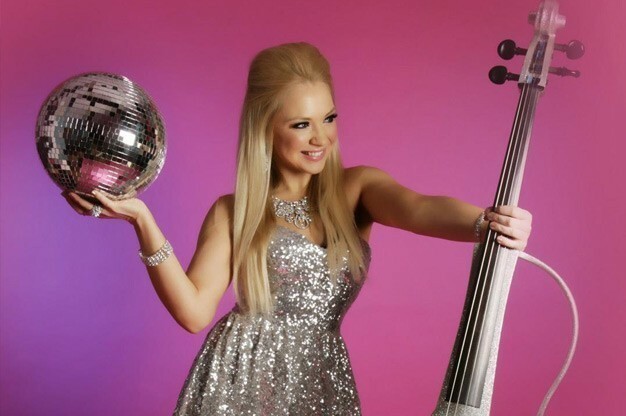 Using our website www.EntertainersWorldwide.com you can contact cellists for free using the “Request a Quote via E-mail” button or by giving them a call if they have chosen to display their telephone number. Never part with any cash without checking out a performer and if you feel that you need to speak with them on FaceTime, Skype or even meet them face-to-face, that’s perfectly acceptable too!